The race started with Vettel on pole and that was about as close as anyone got all day. Well, Nico Rosberg did nose ahead on the run into the first turn but cut the corner on the right turn in the chicane. The loss of grip and speed over the kerb and the runoff let Vettel by and disappear off into the distance. The first lap was pretty dicey as everybody was jockeying for position on the hard-to-pass track. Those early moves were critical because the only thing that allowed passing after this point was tyres. Cars started stringing out early and DRS didn’t seem to make a difference in helping cars pass. The race was fairly dull until Daniel Ricciardo nosed into the barrier at Turn 18 (heading under the grandstand) which resulted in the safety car being deployed. Not only did this bunch the field up but it caused a bunch of drivers onto alternate pit strategies. With first stops being only 10 to 15 laps earlier and some cars already on their second stops, hard decisions were being made. While Vettel, the two Mercedes and Webber stayed out during the safety car period, the likes of Alonso, Grosjean, Raikkonen and the two McLarens stopped to get fresh tyres. The restart didn’t lead to a lot of passing because marbles off-line made passing nearly impossible, even with the aid of DRS. 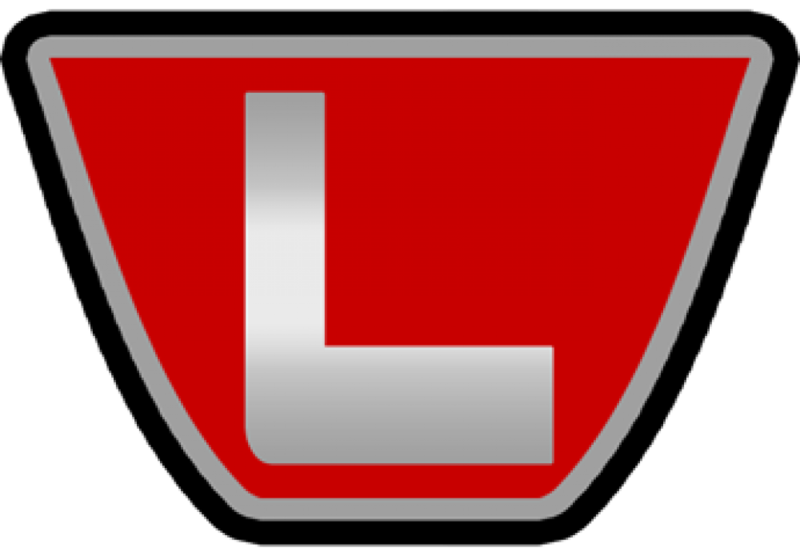 The result was a long train behind Nico Rosberg as Vettel stormed away at the head of the field. Webber’s team decided that his best chance to get by was to undercut on his second pit stop. It was a perfect strategy call as Webber was able to vault in front of everyone who made another stop following the safety car. The later second stops for the Red Bulls and Mercedes shuffled the order again. 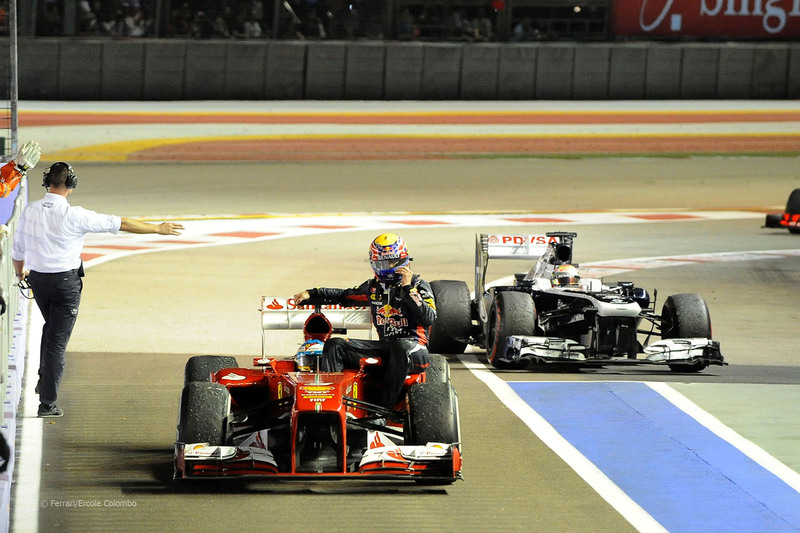 No, Vettel never lost the lead but Webber had to lead a charge through the field. He was doing so successfully until he reached 4th. 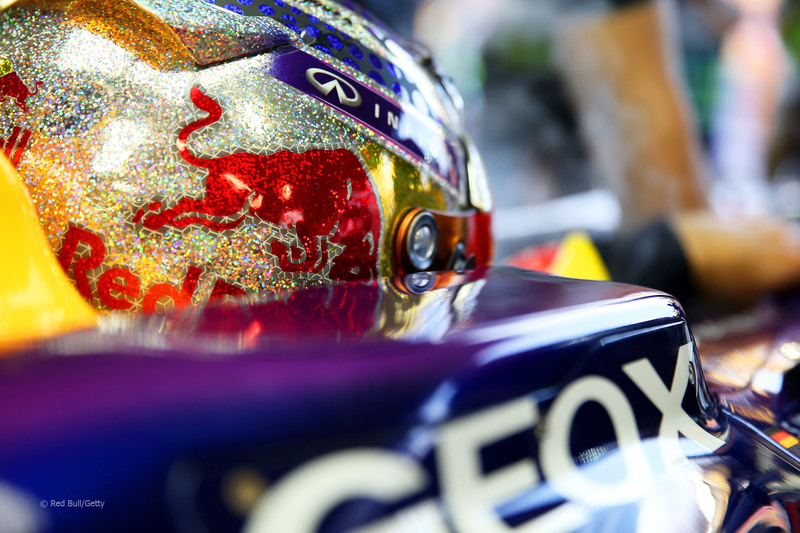 As Webber started to close on Raikkonen, he got repeated messages to short-shift the car. Unlike in Monza, it wasn’t the gearbox but the engine that was packing it in. On the final lap, Webber’s Renault engine died in a burst of flame out the right exhaust pipe. 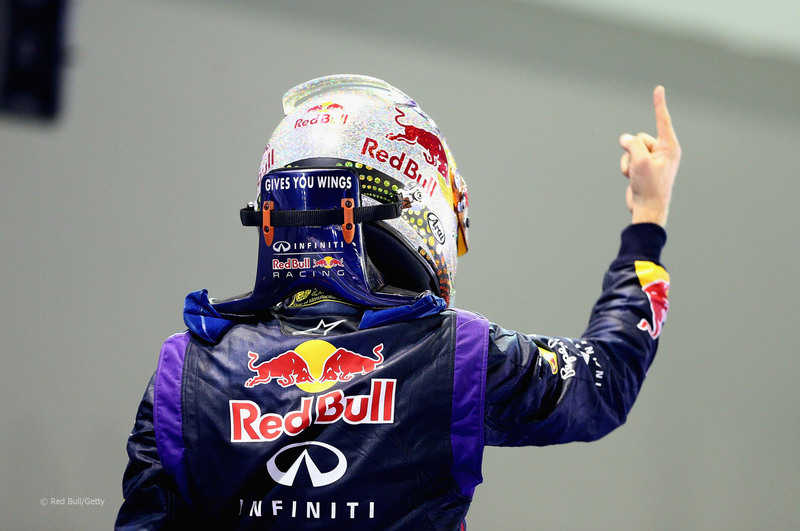 The win was Vettel’s seventh of the season and the 33rd of his career. That moves him into sole possession of 4th on the all-time wins list at only 26 years of age. Fernando Alonso’s spectacular start from 7th got him to a 2nd place finish but he’s now 60 points behind Vettel in the championship chase. Speaking of spectacular races, Raikkonen was able to parlay race pace and strategy into a 3rd. The two Mercedes boys, Nico Rosberg and Lewis Hamilton, rounded out the top five which wasn’t unexpected given their struggles with race pace comparative to the competition. Felipe Massa crossed the line in 6th as he looks for a new job. Jenson Button’s strategy looked like it was going to end well but a late collapse resulted in a 7th. The same strategy resulted in teammate Sergio Perez finishing 8th. Nico Hulkenberg had one of the quicker cars at the end of the race and crossed the line right on Perez’s tail in 9th. Adrian Sutil rounded out the top ten. Following the race, Alonso picked up Webber and gave him a ride back to the pits. The two were last pair to do the time-honoured hitchhiker routine following a race when Webber gave Alonso a ride after the 2011 German Grand Prix. For their part in this display of sportsmanship and comradery, the race stewards issued both drivers reprimands. Webber’s was for entering the track without permission between the formation lap and the last car stopping in parc ferme. Alonso was reprimanded for driving in a dangerous manner because cars had to drive around him when he picked up Webber. The embarrassing part about this is that this is Webber’s third reprimand of the season. By rule, he will be given a ten-place grid penalty for the next Grand Prix. This has to be the dumbest decision made by the FIA and the race stewards in a long time. They’ve made a lot of moronic decisions but this one takes the cake. If the FIA had any sense, they’d rescind the reprimand and publicly reprimand the stewards who made this decision. That makes too much sense so that’s never going to happen. The driver market sure picked up some steam in the two weeks since the last race. Obviously, the big news is that Kimi Raikkonen is returning to Ferrari for the next two years to drive alongside Fernando Alonso. 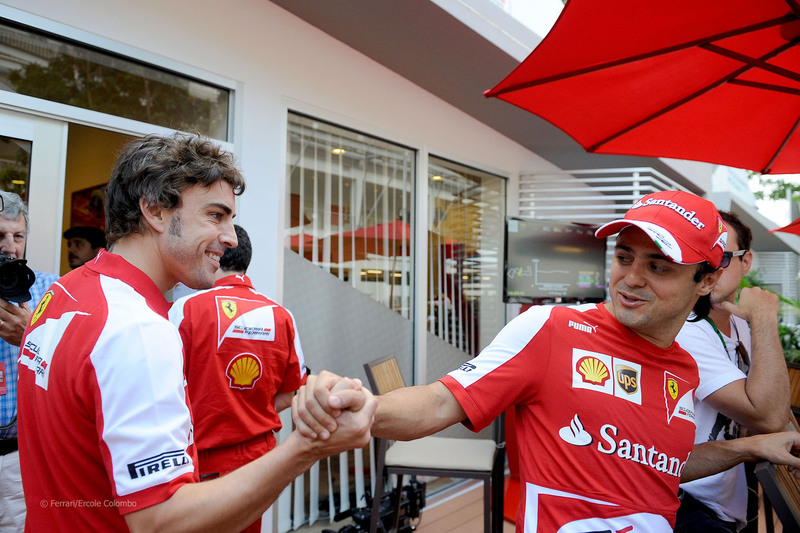 It was believed that the two parted on such bad terms after the 2009 season that they would never get back together. It looks like time and money heals all wounds. One of the emerging storylines as a result of this move is what Fernando Alonso would do. After the 2007 season in which he partnered with Lewis Hamilton at McLaren, it was assumed that Alonso wasn’t interested in having a teammate who could challenge him on pace but would rather have a clear #2 in the other seat. Rumours suggested that Alonso was looking for a new seat as a result of Raikkonen’s signing but he confirmed his commitment to Ferrari for the duration of the season. However, an F1 contract isn’t worth the paper it’s written on so I’m not sold on Alonso saying until next season starts. Meanwhile, McLaren has signed one half of their 2014 driver line-up. Jenson Button was confirmed for next season. Alonso was briefly rumoured to be returning to McLaren, speaking of parting on bad terms. However, Alonso seems to have temporarily put that rumour to rest. McLaren is said to have a short list that includes current driver Perez, Paul di Resta, Nico Hulkenberg and their reserve drivers Kevin Magnussen and Stoffel Vandoorne. Lotus have been very quiet about getting a driver to replace Raikkonen. It’s expected that they’ll sign Hulkenberg whose ability is highly rated by the F1 paddock. However, Raikkonen revealed he left Lotus because he hasn’t been getting paid for most of the season. 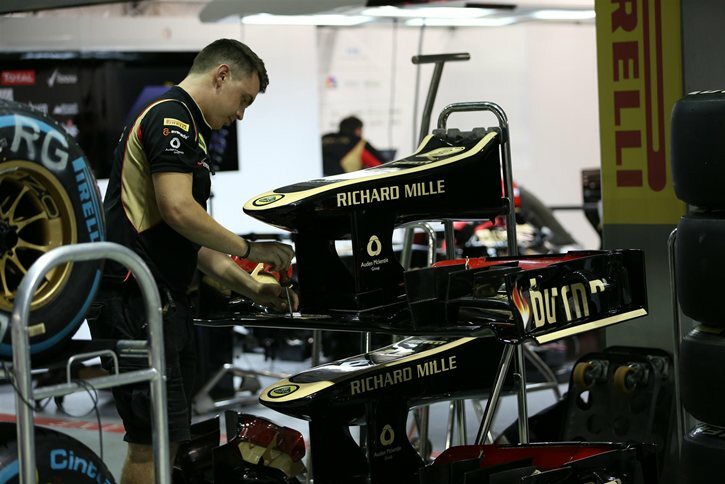 This confirms rumours that Lotus is behind on paying a number of their suppliers. Given that Sauber and Lotus are both having money troubles, is there a good situation out there for Hulkenberg? Lotus’ financial issues do seem to make Felipe Massa an ideal target for the Enstone-based team. The Brazilian driver has said that he’s willing to reach out to sponsors in Brazil to get them to sponsor any team that signs him. In addition to Lotus and McLaren, Massa specifically cited Force India, Sauber and Williams as teams interested in his services. While many of the top drives are locked in for next season, silly season is going to get far more interesting before we’re done. Sometimes I wonder if Formula One doesn’t really want to be taken seriously. The Formula One Technical Committee is planning to introduce a change to the regulations that would limit to only one helmet livery change during the season. Drivers run different liveries for a variety of reasons. Some run special liveries for special events such as Monaco, Singapore, milestone races and their home Grands Prix. However, the Technical Committee feels that changing helmet liveries makes it hard for people watching on TV and at the track to identify the driver of a car. Here’s the problem, though. For years, Formula One was worked under the impression that different coloured tape on the camera on the roll hoop would be enough to help you which car belongs to which driver. Back in the day, cars had big numbers that were visible from a distance to help you identify drivers. What F1 really needs to do to make cars identifiable is to relax on the regulations mandating that car liveries are identical. Cars should have some quickly identifiable difference in the livery, be it a different coloured front wing, rear wing and/or roll hoop. It would be a lot easier to identify Hamilton from Rosberg if one had black wings and the other had silver. In IndyCar, one Target Chip Ganassi car has white wings while the other has red wings. Why can’t Ferrari do that? All that limiting helmet livery will do is continue to limit any expression of personality that a drive has. Even now, I’m not certain that drivers aren’t just robots. 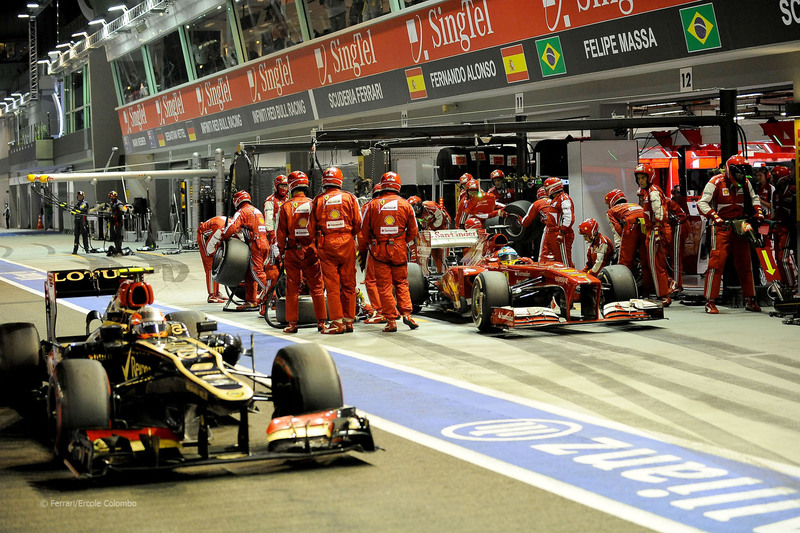 Apart from Raikkonen and Webber, everyone seems painfully dull. Just something as little as a helmet gives a driver to show some personality. I think the sport needs it. Speaking of things not taken seriously, don’t count out the Grand Prix of America that has been been continuously delayed from the originally planned 2012 debut. What started as an Autosport report has been picked up by everyone with all F1 news outlets saying that American motorsport authority ACCUS (Automobile Competitions Committee for the United States) has received an application to hold the race and the organizers have made their initial payment to Bernie. It’s expected to be on a soon to be released revised draft calendar for 2014 which will have a total of 22 races. A firm date has not been set for the GP of America but it will be either immediately before or immediately following the Canadian Grand Prix. Putting the race the week before the Canadian Grand Prix would require Monaco to be moved as that race is two weeks prior to Canada. Putting the American GP after Canada would require the Austrian GP to be moved as that’s two weeks after Canada. Either way, wedging in the New Jersey race now will require someone else’s plans to be changed. 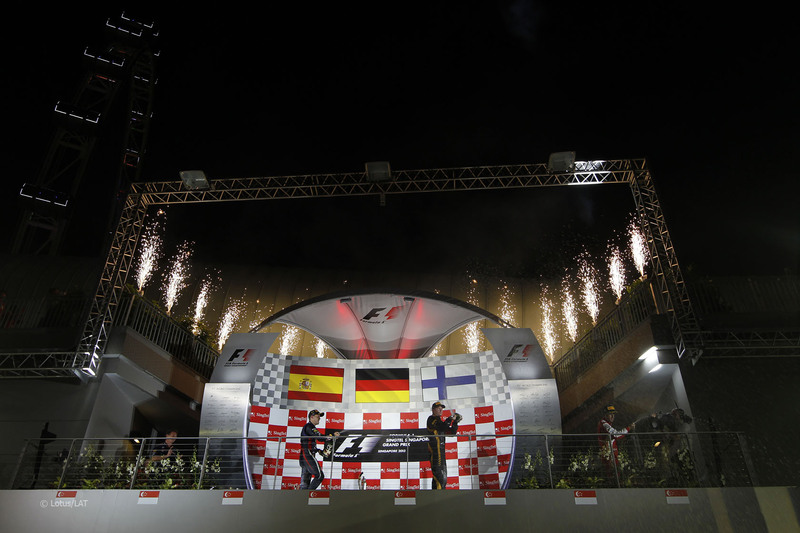 The next round of the 2013 Formula One World Championship is in two weeks time. It’s the annual trip to the deserted swampland that is the Korea International Circuit for the Korean Grand Prix. The track is fairly tricky and technical but the drab, grey wasteland of that track makes it all seem so dull and such a waste. 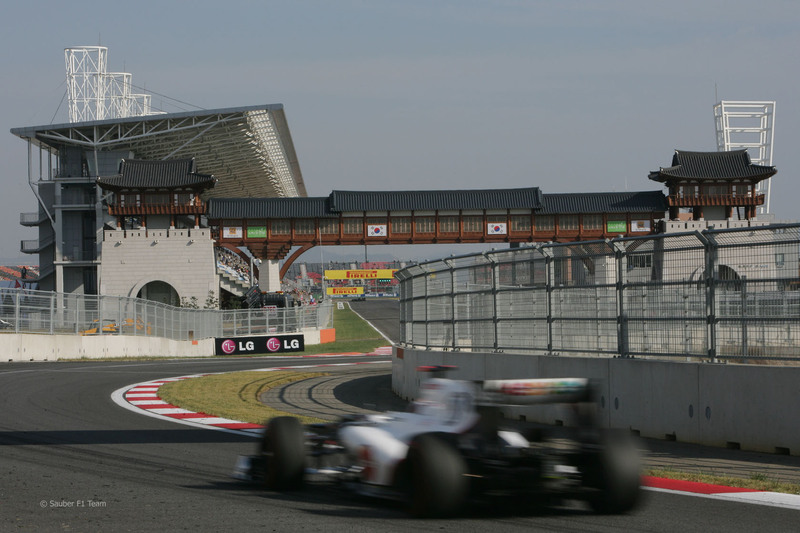 If anywhere should be on the shortlist to be dropped from the F1 calendar, it’s Korea. It shouldn’t be much a surprise that I think Sebastian Vettel is the favourite in Korea. He’s won the last two races there and has been on a roll lately. He’s won the last three races and five of the last seven Grands Prix. If anyone can challenge him (apart from gearbox and engine reliability), it would be Lewis Hamilton whose Mercedes engine power should help him out on the long straights at the Korean circuit.